A joint collaboration of Indian Railways and the Rajasthan Tourism Development Corporation, the Palace on Wheels train made its maiden luxury tour back in 1982. It was voted as the 4th luxurious train of the world in 2010. Later in August 2009, the luxury train was revamped, retaining its old world charm. It offers 7 nights/8 days of a royal journey covering amazing tourist destinations of North India - Jaipur (the Pink city), Jaisalmer, Jodhpur, Ranthambore National Park, Chittorgarh, Udaipur (the city of Lakes), Bharatpur bird sanctuary and the symbol of love and romance, Agra, before returning to Delhi, the capital of India. The pioneer of India’s luxury travel is inspired by royal carriages of kings and rulers of the bygone era in India. These carriages are each named after a precious stone while the interiors reflect royalty. Guests are treated with hospitality of palatial times with the spirit of Atithi Devo Bhava that translates to ‘Guests are like God’. The Palace on Wheels itinerary is specially designed for guests to get the most out of their short trip of luxury. With UNESCO World Heritage Sites, rock-carved forts, wildlife safaris, and bird sanctuaries, there is a wide range of world famous tourist spots to visit during the trip.At times, during the tour or off - board excursions, guests can choose between certain activities. Time is alloted in such a way so that Guests may participate in interesting activities like shopping, spas, etc. One of India’s finest luxury trains - Palace on Wheels won several prestigious awards since its maiden trip. 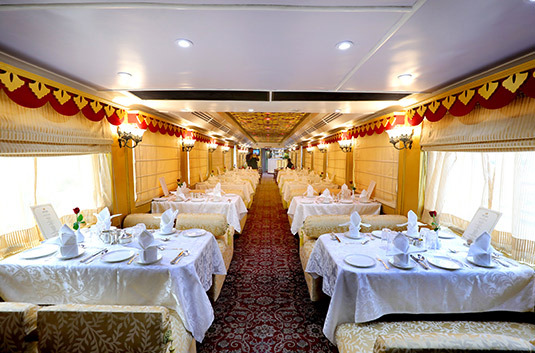 There were makeovers and enhanced onboard facilities on Palace on Wheels to provide guests with the best experience. The former personal carriages of Kings that also transported foreign dignitaries & Nizams is now available for domestic & international tourists/ travelers to experience royalty and king’s culture. Book your tickets for Palace on Wheels through ThePalaceonWheels.org which is a user friendly & trusted web portal serving several world travelers. All the best for a Royal Luxury Experience and Amazing Sightseeing Tour on India’s finest budget- friendly luxury train - Palace on Wheels! Q . Who owns the Palace on Wheels? A : It is operated by Rajasthan Tourism Development Corporation and Indian Railways. Q . Are pets allowed in Palace on Wheels? A : No, pets are not allowed inside the train. Q . What are the travel documents required for the travel? A : Every foreign passenger irrespective of age should hold a valid passport and visa. The Palace on Wheels ticket confirmation document should be shown whenever requested. Q . How early should I book tickets? A : It is recommended to book at least two to three month in prior to the departure date. The demand for the tickets is quite high, especially during tourism season. Q . How to pay for the tickets? A : The portals accept all major international credit cards like Master, Visa, American Express, Discover and so on. You can also choose bank transfers. Bank details will be provided upon request. Q . Do I need visa to travel in Palace on Wheels? A : Every non-India has to hold a valid Indian visa to enter into the country. Palace on Wheels will not specifically request you to provide passport or visa details. Q . Are there any regulations for dressing in the train? A : There are no specific dress code for the tourists. It is recommended to wear anything that is comfortable and decent. Q . What type of dresses are recommended? A : India is a tropical land. If you are visiting during winter, choose to carry jackets with you. Else, thick cotton clothing will be quite enough. For safari, wear sunglasses, hats and thick shoes. Q . Where does the itinerary start and end? A : The train journey starts and ends at Safdurjung Railway Station, Delhi. Q . How long is the train journey? A : Palace on Wheels has one signature itinerary, which spans for eight days and seven nights. Q . Is the itinerary open throughout the year? A : No, the itinerary is open only from September to April, every year. Q . What is the ticket cost for a child in Palace on Wheels? For children between 5 and 12 years, 50% of the total ticket cost. Q . Will the cost be altered in virtue of any celebrations? A : During festivals like Christmas and New Year, additional 10% surcharge is added to the total ticket cost. Q . Are gratuities a part of the train fare? A : Gratuities are not a part of the tariff. Q . Will there be a reduction in tariff if I cut short the train journey? A : No, refund would not be provided if the journey were cut-short due to any reason. Q . Are the meal included in the tariff? A : Every meal provided inside the train and in specific hotels, as a part of the itinerary are included in the tariff. Any other eatables you buy during sightseeing will not be covered in the fare. Q . When does each trip start and end? A : It is recommended to take a travel insurance of your choice. You would be covered under a common insurance of Palace on Wheels against damages caused due to natural disasters like flood, earthquake, terrorism and others. Q . Do I need to take any vaccination to travel in Palace on Wheels? A : Palace on Wheels does not demand any vaccination certificates from the travelers. However, if you are visiting from any Yellow Fever epidemic country, you need vaccination certification to enter India. Q . Can I cancel the booked tickets? What is the cost of cancellation? A : Yes, you can cancel the tickets whenever needed. If you cancel 90 days before departure date, 10% of the total ticket fare is deducted. If canceled between 30 and 89 days from departure date, 20% of the cost is deducted. If canceled within 29 days from departure date, no refund is made. Q . Can I transfer the ticket to another person? A : No, tickets under one name cannot be used by another. Q . Is my tour insured? A : The itinerary starts and ends on Wednesday. The tour starts on a Wednesday evening and ends on the next Wednesday morning. For upcoming departure dates, visit https://www.thepalaceonwheels.org/departures.html. Q . Will Palace on Wheels cancel the booked tour? A : The train needs a minimum number of passengers for profitable functioning. If the threshold is not met, the tour will be cancelled and complete refund is made. In case of tour being cancelled because of any natural calamity, no refund would be provided. Q . When was the first tour of Palace on Wheels started? 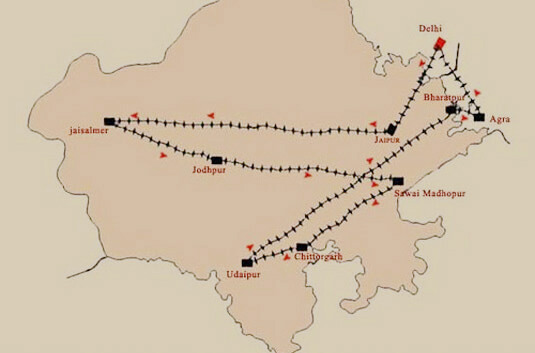 A : The first tour of Palace on Wheels started on Republic day, Jan 26th of 1982. Q . What is the history of Palace on Wheels? A : In the past, the royal heirs of Rajputana, Gujarat and Hyderabad traveled from one place to another in royal trains. Even the British rulers used specially crafted saloons filled with luxury amenities to travel the region. After independence, these saloons were left unused until 1982, when the tourism department of Rajasthan took over these saloons, refurbished them and created the honorable Palace on Wheels. For a more detailed history, visit https://www.thepalaceonwheels.org/history.html. Q . How many coaches are there in Palace on Wheels? A : There are 14 coaches and each coach has varying number of cabins, based on the style of accommodations. Q . Does the name of coach make any difference? A : The coaches are named after the princely states of Rajasthan. The types of facilities and accommodations within the same style of cabins are same. With regards to the coach name, the decor style of the cabin varies. For instant, Alwar coach hold decor of cone works with pink interior. Bharatpur coach holds paintings of bird species with inlay works in aqua green interior. Jaipur coach holds ceiling foil-work decoration, miniature paintings and zardozi work in gold and blue interior and so on. Do you want to know more about the coaches? Read https://www.thepalaceonwheels.org/coaches.html. Q . How many passengers can be accommodated in the coaches? A : Apart from the staffs, 82 passengers can be accommodated during a trip. Q . What are the amenities available inside the cabin? A :Security safe, TV, DVD player, attached bathroom, channel music, toiletries, telephone services and many others. A few furniture are also provided inside the cabins. Q . What are the types of accommodations available in Palace on Wheels? A :There are two types of cabins, Deluxe cabins and Super Deluxe cabins. Each type of cabin holds both single occupancy cabins and double occupancy cabins. Q . How Much luggage is allowed inside the cabin? A : Limited space is provided under the bed for storing luggage. Thus, stick with the airline regulation of luggage. Q . How is food served inside the train? A : There are two restaurants inside the train, where the food is served inside the train. 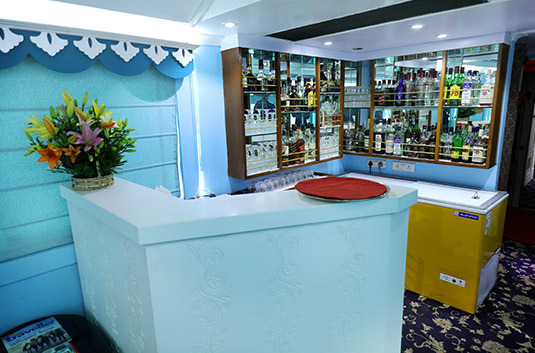 For more details about dining cars, visit https://www.thepalaceonwheels.org/dining-and-bar.html. Q . What type of cuisine is served in Palace on Wheels? A : In general, you will be served top cuisines like Continental, Indian and Chinese. You will be served traditional Rajasthan dishes too. If you require any special diet food like lactose-free dishes, kosher diet, gluten-free diet and others, mention during the booking. Q . Does the train provide laundry services? A : There is no such service inside the train. However, at specific destinations, you can opt for laundry service and the clothes will be delivered at the next destination. To know when the laundry service is available, talk to your butler. It is an add-on service and is not covered in the tariff. Q . Am I entitled to have a butler? 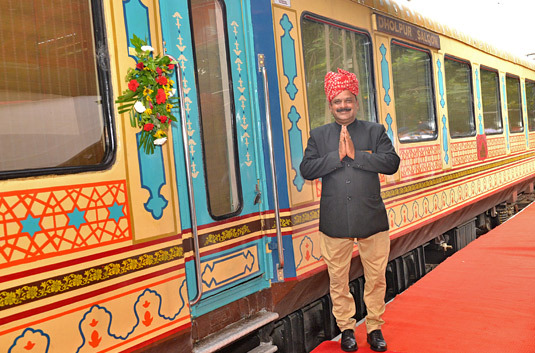 A : Every traveler of Palace on Wheels will be served by a butler. Each coach of Palace on Wheels holds one butler, who is at service 24/7. Q . Are there any facilities for physically challenged tourists? A : If you are in need of wheel chair or other services, please mention during booking. The train cabins can be easily accessed via wheel chair. Q . Are there any medical facilities available? A : A paramedic is available throughout the journey. However, not all medicines would be available on-board. If you have a pre-existing medical condition, it is better to bring your medicines with you. Q . Is there internet facility in the train? A : Internet facility is available throughout the journey. However, the strength of the signal depends on the location of the train. While the train is at halt at any major station, the strength of the signal will be very good. Q . Is smoking allowed in the train? A : No, smoking is not allowed in any part of the train. If you wish to smoke, talk to your butler, he would assist you. Q . Who will be served drinks in Palace on Wheels? A : Only those who are 21 years old or older will be served alcohol. Q . What are the facilities available in the lounge room? A : You can find many armchairs to sit and enjoy the scenery through panoramic windows. Books are available for those who want to read for a while. Small indoor board games are also provided. 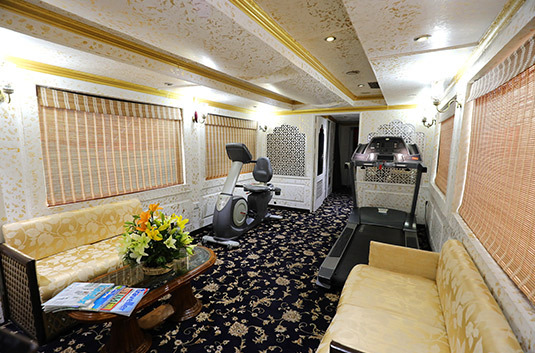 For more facilities of Palace on Wheels, visit https://www.thepalaceonwheels.org/facilities.html. Q . What type of therapies are available in the Spa? A : You can find a long list of Ayurvedic therapies in the spa. In addition, you can enjoy massages and specialized treatments for any specific requirements. For more details about the spa, visit https://www.thepalaceonwheels.org/lounge-spa.html. Q . Is the Spa session covered in the tariff of the train ticket? A : No, spa sessions are not included in the tariff of the train fare. Q . When should I reach India for Palace on Wheels tour? A : To avoid hassle at the last minute, it is recommended to reach Delhi station at least a few hours in prior to the departure time. It is better to book hotels for a night post and pre tour. Q . Are the hotel accommodations covered in the tariff? A : Any accommodation or travel; prior or post the train journey is not covered under the tariff of the ticket. Q . Are the fly-in and fly-out tickets included in the fare? A : No, any form of transportation before or after the tour is not included in the fare. If you require assistance in booking domestic or international tickets, contact the representative.